Home » Research » Who is Generous to Refugees? Who is Generous to Refugees? What does it mean for a country to be ‘generous’ to refugees? The term “generous” is frequently used in discussions about displacement, but often with different connotations. Countries that accept large numbers of refugees—such as Canada’s 2015 decision to resettle 25,000 Syrian refugees—have been praised as ‘generous’. At the same time, the term is used by admirers and critics alike to describe or disparage policies considered ‘generous’ towards refugees. World leaders, religious figures, and leading voices all talk about refugees in terms of ‘generosity’, without ever defining the word. We looked for an existing gauge of the world’s efforts to support refugees but could not find one. So, we decided to create our own approach. In this report, we’ve created a set of indicators and dashboards to provide a more objective assessment of ‘generosity’ towards refugees. In doing so, we hope to challenge conventional wisdom about what it means for a country to be ‘generous’ to refugees. Drawing from publically-sourced data, we analyse wealth, population, and refugee figures to tell the story of global generosity towards refugees between 1995 and 2015. The dashboards below display UNHCR and World Bank data to bring a new perspective to this topic. • Analyses refugee generosity by region, underscoring the key role of developing countries in supporting refugees. We understand that this approach is limited by its reliance on macro-level data; gross domestic product (GDP) and other economic indicators can never fully capture how a country engages with refugees. Similarly, the UNHCR data on refugees is imperfect, as certain types of displaced people are under-represented or omitted. Using these broad datasets allows for a global comparison of refugee generosity, but also highlights the need for further data and analysis on refugee generosity, particularly at the national and sub-national levels. At a time when global displacement has reached record figures—65.6 million displaced persons worldwide (including both internally displaced persons (IDPs) and refugees) —we hope this report inspires new and creative efforts to improve how countries engage with refugees. Both critics and supporters of refugee policies use the words ‘generosity’ and ‘generous’ to assess how countries meet their responsibilities towards refugees. For some, a country is ‘generous’ when it increases the number of refugees it accepts within its borders. For others, ‘generosity’ refers to a country’s spending on refugees — the resources, social services, and job opportunities available to refugees. Anti-immigration proponents claim that refugee policies are overly ‘generous’, while human rights advocates argue that refugee admissions in rich countries are not ‘generous’ enough. Which definition is correct? How do we define the term ‘generosity’ towards refugees? An intuitive understanding of ‘generosity’ would suggest that it is based on two factors: the number of refugees that a country hosts within its borders, and the amount of funding that it makes available for refugee services and sustainable integration. For example, a country’s willingness to admit greater numbers of refugees or fund refugee education, health care, and jobs could be seen as more ‘generous’. Taking an expanded view, investing in addressing the root causes of displacement—preventing people from ever needing to flee their homes in the first place—could also be viewed as an indicator of ‘generosity’. Throughout Seefar’s work on refugee systems, displacement, and asylum-seeker decision-making, we have continuously looked for a gauge of how the world distributes its efforts to aid refugees. However, we’ve found that no standardized metric of global refugee generosity exists. Seefar created this project to begin to address this gap: the dashboards below provide a basic set of indicators to assess and rank a country’s generosity towards refugees. This report is just one step in defining generosity towards refugees as, due to limitations on available data, the core of this project is taken from 1995 -2015 figures. For more updates on this research for 2016 and 2017, register here. The simplest metric of assessing a country’s generosity towards refugees is to examine the size of the refugee population that it hosts. Using data from UNHCR, we can visualise the number of refugees hosted within each country’s borders and make comparisons between countries. Before diving into the numbers, this dataset raises several important questions. Who is a refugee? Who is included in UNHCR’s data? While useful, aggregate refugee numbers do not tell the entire story of people around the world who are in need of international protection. For example, people who are able to access migration opportunities may escape a conflict or persecution before they would be considered as refugees, and consequently would not be included in this dataset. Similarly, the number of refugees hosted in a country is likely related to the ability of refugees to physically travel to that country. While two states may have the same willingness and ability to host refugees, it is likely that the country that is closer to an active conflict will host a larger refugee population. On a technical level, the UNHCR data includes estimation methodologies that may not be entirely accurate. Its notes on country figures explain, “In the absence of Government figures, UNHCR has estimated the refugee population in many industrialized countries based on 10 years of individual asylum-seeker recognition.” This methodology introduces a certain level of variation into our analysis — in other words, the reported number of refugees in a country may be different from the actual population of refugees in some cases. With these caveats in mind, the UNHCR dataset is sufficient to start the conversation on generosity towards refugees. This data leads us to ask two further analytical questions. First, how do we treat countries that report zero refugees, or host only small numbers of refugees? Underestimating these figures leads these countries to drop out of our rankings; conversely, reporting inflated refugee numbers could lead to a country’s inappropriate inclusion in our analysis. To address this issue, our rankings only include countries that host at least 10,000 refugees. Second, how can our evaluation of generosity account for the speed with which countries resolve individual refugee cases? Based on UNHCR’s definition, a refugee is no longer included in their dataset when she or he has obtained a durable solution. Yet countries significantly vary in how they facilitate durable solutions for refugees, which may affect assessments of how generous they are to refugees. For example, Germany may convert refugee visas into permanent residency authorization in less than one year, while Belgium may take up to four years to do the same. Consequently, refugees in Belgium may appear in UNHCR’s dataset for four years, while refugees in Germany appear in just one year. Slower refugee conversion processes create an ‘echo’ effect in the measurement of a country’s generosity. More extreme examples can be found in contexts like Pakistan, where some Afghan refugees have been included in UNHCR’s statistics for decades. Germany and Belgium convert 50 refugees to permanent residents each year, while Pakistan does not grant permanent residency to refugees. Germany converts refugees to permanent residents within one year of arrival. Belgium requires refugees to wait four years before being granted permanent residency. The dashboard illustrates the results of this exercise. In 2015, Germany reported hosting a population of 250,299 refugees, Belgium reported 31,115 refugees, and Pakistan was listed as hosting 1,540,854 refugees. Which country is the most generous? If our analysis only considers 2015 data, Pakistan hosts the second-largest population of refugees in the world. Looking solely at the number of refugees hosted in 2015, these numbers would lead us to label these six countries as the most generous to refugees. Yet that analysis over-simplifies the story of refugee generosity, as it narrowly examines UNHCR records for just one year. These rankings do not speak to the services refugees received in-country, the burden on the host country, and the number of refugees that have achieved a durable solution and thus are not included in the dataset. Moreover, these rankings do not consider a country’s wealth, our next dimension of analysis. Being generous implies sharing wealth, even if a country’s resources are limited. To examine wealth — and wealth relative to population size — we can compare living standards across the world in 2015 by analysing data from the World Bank. We begin by looking at each country’s GDP Purchasing Power Parity (GDP PPP), an aggregate figure of a country’s total wealth. The advantage of GDP PPP is that it can be used to analyze a wide range of countries over a long time frame. Discussions of ‘generosity’ in Western countries tend to acknowledge that non-Western countries host a disproportionate share of refugees, but they have no basis for comparing this burden other than through refugee population size. The data we use provides a method for making this comparison by focusing on economic capacity. While aggregate wealth is a useful indicator for this project, it does not account for the fact that more populous countries may have less available resources per person than less populous countries. GDP PPP per capita, therefore, provides the best metric of analysis to standardize and compare wealth based on population size. This metric looks not only at the total wealth of the country, but provides a measure of how much of that wealth corresponds to each individual living in that country. Like GDP PPP, using GDP PPP per capita allows us to make comparisons between countries to discuss economic ability to support refugees. Despite the advantage of the breadth of the data, there are still limitations, such as the lack of micro-level detail; many types of assistance a country can provide to refugees cannot be discerned in macro-level data such as GDP PPP and population. For example, there have been efforts in Europe to compare the generosity of countries using indicators on income support, refugee access to healthcare, and financial aid for housing. Moreover, these metrics do not account for a country’s foreign assistance and humanitarian aid, which in many cases is used to support refugees in their place of displacement. Averaging the GDP rank and the GDP (PPP) rank to produce an Economic Rank. If either value is missing, we used a single value. Averaging the Economic Rank and the Population Rank, rounded to the nearest whole number. If either value is missing, we used a single value. Comparing these ranks with the data on refugees, we see a clear mismatch between per capita wealth and refugee population size. The top six GDP PPP per capita countries hosted a combined population of just 1,918 refugees in 2015. How do we reconcile this discrepancy? Given that Turkey has a GDP PPP per capita that is nearly four times the GDP PPP per capita of Pakistan, is it fair to say that Pakistan is more generous to refugees than Turkey? How do we compare Ethiopia, which hosted a population of over 700,000 refugees with a GDP PPP per capita of 1,431 USD, with Lebanon, which hosted over 1.1. million refugees with a GDP PPP per capita of 16,659 USD in 2015? While we could develop a comparative metric for generosity specific to 2015 that would allow for such comparisons, we are more interested in discussing generosity towards refugees over a longer period of time. To achieve that goal, we need to go deeper into the data. In order to better understand generosity towards refugees over time, we need to explore how the refugee populations hosted by each country varied between 1995 – 2015. Were the countries hosting the most refugees in the beginning of this period the same twenty years later? The annual refugee population of every country between 1995 – 2015 is visualized in the interactive dashboard below. Several countries immediately stand out: Chad, Germany, Guinea, Iran, Jordan, Kenya, Pakistan, Syria, Tanzania, the United Kingdom, and the United States consistently ranked as some of the top refugee-hosting countries. Even as the global number of refugees fluctuated over time — from a high of nearly 15 million in 1995 to a low of under 9 million in 2005—these countries continued to host large numbers of refugees. In 1995, Guinea hosted almost 700,000 refugees—one of the largest populations of refugees in the world. Since that time, the refugee population in Guinea has consistently decreased, leaving it with less than 10,000 refugees in 2015. On the other hand, Tanzania hosted more than 600,000 refugees each year between 1999 and 2004. While the refugee population in Tanzania fell by over 70% between 2004 and 2009, Tanzania still hosted more than 150,000 refugees in 2015. Kenya’s refugee population stayed around 250,000 until 2007, when the number of refugees it hosted began to spike. Since 2011, Kenya’s refugee population has remained at over 500,000 each year. Ethiopia hosted at least 100,000 refugees in each year of the dataset. From 2008 to 2015 the number of refugees in Ethiopia increased annually, peaking at more than 700,000 refugees in 2015. France has also hosted a refugee population of at least 100,000 each year between 1995-2015. From 2005 (when France hosted 137,316 refugees) to 2015, the number of refugees living in France nearly doubled to 264,972 refugees. The United Kingdom’s refugee population peaked between 2001 and 2010, when it hosted between 200,000 to 300,000 refugees each year. Since 2005, the United Kingdom’s refugee population has decreased or stayed the same each year, leaving it with a refugee population of 117,234 in 2015. The refugee population recorded in the United States steadily decreased between 1995-2015, dropping from over 600,000 refugees in 1995 to about 267,000 refugees in 2015. 2006 was a notable outlier to this trend, as the United States reported a refugee population of about 843,500 refugees that year. Germany’s population of refugees within its borders can be broken into three distinct periods. Between 1995 and 2004, it was home to an extremely high number of refugees: annual records vary between 900,000 and 1,300,000 refugees during this period. This population fell to 600,000 – 700,000 between 2005 to 2012. Most recently, the refugee population has decreased even more, averaging roughly 200,000 refugees each year from 2013 to 2015. While Syria is characterized today primarily as a source country of refugees, prior to 2011, Syria hosted large populations of refugees. Between 2006 and 2011, Syria hosted between 700,000 to 1,500,000 refugees within its borders each year. Iran hosted between 1.8 – 2 million refugees each year from 1995 to 2001. Since 2003, Iran’s refugee population within its borders has considerably decreased, but Iran remained home to one of the largest populations of refugees in the world. 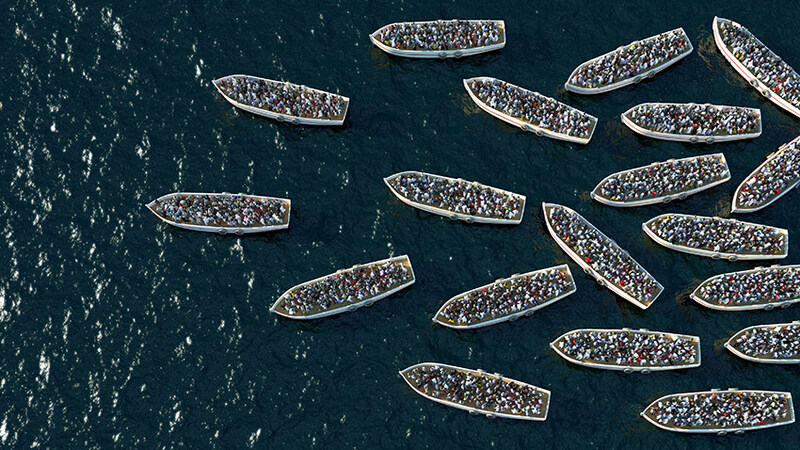 From 2003 to 2015, the refugee population in Iran has oscillated between 800,000 to 1,000,000 people. Jordan has long been home to a large population of refugees (particularly Palestinian refugees, many of whom have lived in Jordan for generations). However, beginning in 2006, Jordan’s refugee population grew substantially larger. From 2006 to 2015, Jordan hosted between 500,000 to 700,000 refugees every year. Pakistan hosted more than 1,000,000 refugees within its borders each year. This population peaked in 2001, when the number of refugees living in Pakistan reached nearly 2.2 million. After decreasing over the next few years, Pakistan’s refugee population spiked again to be over 2 million refugees. These examples demonstrate the variance in refugee populations hosted within countries over time. The population of refugees within each country is influenced by internal events — for example, the outbreak of armed conflict in Syria led to a dramatic decrease in refugees within the country — as well as external events, such as conflict or political movements in nearby countries. Moreover, the political willingness of countries to host refugees changes over time. Consequently, these numbers alone make it challenging to attest to a country’s generosity over an extended period of time towards refugees. These figures raise another question, as many of the countries listed above as major refugee-hosting countries are far from the world’s wealthiest states. Are richer countries more likely to host large numbers of refugees than countries with less wealth? This question aims to inform the long-discussed point that countries with developing economies are more ‘generous’ to refugees than countries with more developed economies. The dashboard below visualizes the population of refugees within each country between 1995 – 2015 and also codes countries based on economic region. This dashboard illustrates how, between 1995 and 2015, the refugee population living in the developing region is significantly greater than the number of refugees hosted in the developed region. While the difference between the two aggregate refugee populations changes each year, the refugee population living in the developing region is generally three to six times greater than the number of refugees hosted in the developed region. For example, in 2015, countries in the developing region hosted more than 12.3 million refugees, whereas countries in the developed region hosted a combined 2.1 million refugees. A reasonable criticism is that wealth is not the only dimension of a country’s ability to be ‘generous’ to refugees; countries with larger populations, including those in the developing region, may be better able to host refugees. Without controlling for population, a comparison of the number of refugees hosted in each region misses part of the picture. To address this point, we examined the world’s most-developed and least-developed countries and the percentage of the total populations comprised of refugees. As these figures sometimes evolved over time, we calculated the average percentage of a country’s population that were refugees between 1995 to 2015. In the 47 countries coded as within the ‘developed region,’ the average percentage that refugees represented in their host country’s population tended to be extremely low. In the United States, for example, refugees represented 0.1% of the US population on average. This number was 0.5% for Canada and 0.3% for both France and the United Kingdom. These three countries are the only members of the ‘developed region’ where the refugee population represented at least 1% of the host country’s population. As the ‘developing region’ contains 150 countries, our analysis focused on the 40 countries with the lowest economic indicators. In the 40 least-developed countries, we similarly see that the percentage of refugees relative to their host country’s population remains low, varying from less than 0.1% to 2.5%. While this comparison of the two regions is interesting, it does not shed much light on the comparative generosity of different types of countries. Further analysis is needed of how a country’s wealth relates to its refugee population. In the next step of our analysis, we calculate the ratio of each country’s refugee population to its GDP PPP per capita; in other words, we develop a metric indicating how many refugees correspond to a country’s per capita wealth for each year of the period 1995 – 2015. As previously explained, the GDP PPP per capita is a macroeconomic indicator of a country’s wealth and purchase power parity available in a given year, divided by the country’s total population. This figure expresses the average wealth per resident of a country. Armed with GDP PPP, total population, and the population of refugees of each country, we can simply calculate how many refugees correspond to the GDP PPP per capita of a country for a given year. Hosting large numbers of refugees relative to their GDP PPP. Below, we visualize these scores and compare countries. For this part of the analysis, we present five snapshots of the world between 1995 and 2015. The Democratic Republic of the Congo, with 1,988 refugees corresponding to its GDP PPP per capita of 721 USD. Ethiopia, with 684 refugees corresponding to its GDP PPP per capita of 576 USD. Guinea, with 643 refugees corresponding to its GDP PPP per capita of 1,045 USD. The Democratic Republic of the Congo, with 734 refugees corresponding to its GDP PPP per capita of 493 USD. Pakistan, with 629.2 refugees corresponding to its GDP PPP per capita of 3,495 USD. Tanzania, with 420.6 refugees corresponding to its GDP PPP per capita of 1,538 USD. Pakistan, with 415.4 refugees corresponding to its GDP PPP per capita of 4,287 USD. The Democratic Republic of the Congo, with 286.6 refugees corresponding to its GDP PPP per capita of 578 USD. Chad, with 19.4 refugees corresponding to its GDP PPP per Capita of 1,736 USD. Pakistan, with 374.1 refugees corresponding to its GDP PPP per capita of 4,380 USD. Ethiopia, with 305 refugees corresponding to its GDP PPP per capita of 1,234 USD. Kenya, with 211.6 refugees corresponding to its GDP PPP per capita of 2,670 USD. Ethiopia, with 491 refugees corresponding to its GDP PPP per capita of 1,431 USD. Pakistan, with 335.7 refugees corresponding to its GDP PPP per capita of 4,590 USD. The Democratic Republic of the Congo, with 225.3 refugees corresponding to its GDP PPP per capita of 712 USD. These snapshots illustrate how countries with extremely limited wealth hosted considerable numbers of refugees relative to their means. This data brings to life the anecdote that poorer countries appear to be more generous to refugees than countries that have more wealth available for their population. Next, we take this approach a step further and measure how generous countries were to refugees over the full time period of interest (1995 – 2015). In order to make this assessment, we look at both the accumulated wealth of countries over this twenty-year period as well as the cumulative population of refugees hosted in the country. For this analysis, we only included countries that hosted at least one million of refugees from 1995 to 2015. We then compared each country’s refugee population with its accumulated wealth, relative to its total population. In this visual analysis, we observe how the cumulative number of refugees hosted by each country (expressed in blue) largely overwhelms the accumulated per capita wealth available in each country (expressed in orange), with several notable exceptions. In other words, during this period, we see that Germany’s cumulative per capita wealth was ten times greater than that of Pakistan, but Pakistan hosted more than double the number of refugees as Germany during the same time frame. Using this approach, there is a strong empirical argument that Pakistan was more generous to refugees than Germany between 1995 – 2015. Another example: Between 1995 and 2015, Tanzania hosted a cumulative refugee population of 8,935,391 persons, while one Tanzanian inhabitant has accumulated a purchasing power parity of 38,562 USD. During the same period, United States has hosted a similar number of refugees (8,880,447), but one US inhabitant has accumulated almost 30 times greater per capita wealth (999,350 USD) than a Tanzanian. One positive implication from the research is that it will be relatively cheap to increase assistance to most refugees, since they are in relatively cheap countries. An extra dollar of support from wealthier countries will go a long way if directed to places that are currently the most generous towards refugees. If you’d like to have more updates on this research for 2016 and 2017, register here. UNHCR, Refugee population by country of asylum, 1960-2013 (end-year figures). UNHCR, UNHCR Statistical Yearbook 2014, 14th edition, 2015. For 2015, we used the UNHCR Mid-Year Trends 2015. Wherever data sources refer to West Bank, Gaza, Palestine or the State of Palestine, we have used the label Palestine.